The 2018 Metris Cargo Van. For small businesses that need to bring along gear and make deliveries, buy or lease a 2018 Mercedes-Benz Metris Cargo Van. The 2018 Metris Cargo Van can help you get from point A to point B and run through your to-do list in no time. Thanks to its turbocharged engine and wide array of driver-assistive features, this new work van is the only choice for drivers. Come see the 2018 Mercedes-Benz Metris Cargo Van for sale at our Mercedes-Benz dealership near Redlands, CA, today! 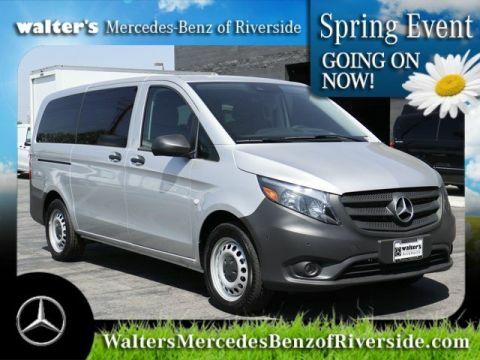 Come to Walter’s Mercedes-Benz of Riverside today to buy or lease a 2018 Mercedes-Benz Metris Cargo Van. Our Mercedes-Benz financing team can help you go over your Mercedes-Benz lease and financing options! *The Bluetooth® trademark is owned by the Bluetooth® SIG. **harman/kardon® and Logic 7® are registered marks of Harman International Industries, Incorporated..